Donations: This was our best year yet for donations. If we earn more in the future, we’ll be able to give more. Savings: We’re saving for a house, children, and retirement. Housing: Our costs were unusually low because we’re renting from Jeff’s parents. This will go up soon when we buy a house. Medical: Jeff’s work pays for most of our health insurance, but we pay for some of the insurance and some out-of-pocket expenses. These numbers are atypical, because Jeff earns more as a computer programmer than most people do. (He’s an example of the earning to give model — if you want to be able to donate more, seek a higher-paying job.) 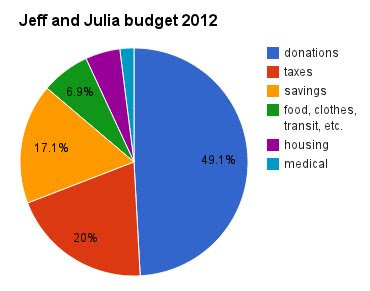 We also save on living expenses because we’re two people living together. 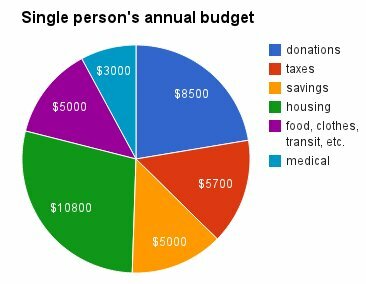 So let’s look at how I might budget if it were just me. This hypothetical budget is based on my earnings as a social worker from the past year, including four months when I was unemployed. My total income was around $38,000 (close to median personal income in the US). So even on a modest salary, it’s possible to give a significant amount. You don’t even have to live in a cardboard box, I promise. Previous Post Agora: Five steps to making every donated dollar more effective.